How To Bring An Animal From Another Country Back To The U.S. 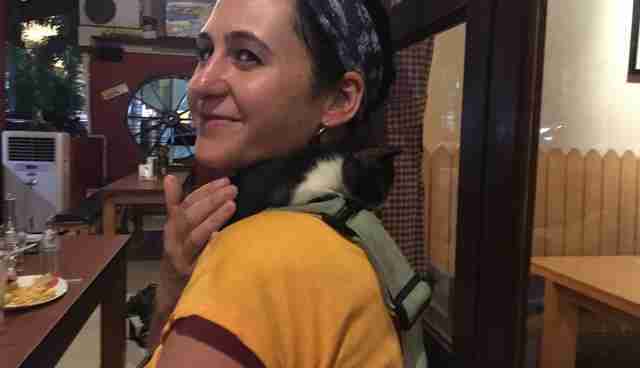 I fell in love with a kitten in Indonesia and couldn't leave her behind. I dashed down the sidewalk as the taxi pulled over on the Manhattan street. The back door opened and my breath caught - this was the moment I'd been waiting for. 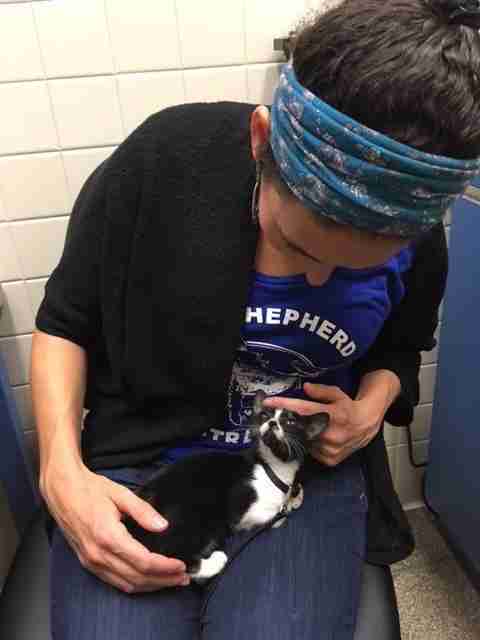 I reached my hands out as my friends passed me a black and white bundle of fur. 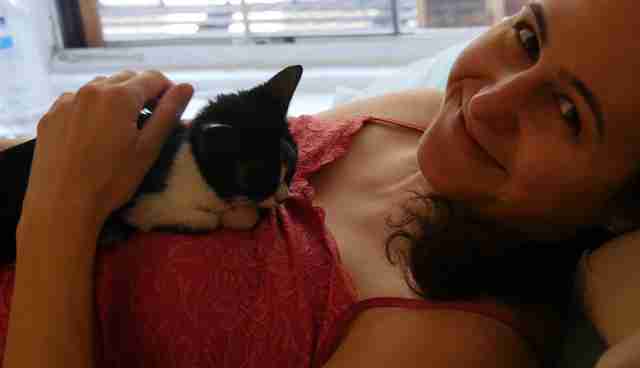 The kitten - named Indah - snuggled into my neck, meowing her head off. The last place I'd seen Indah was in Medan, Indonesia, where I'd gone this past June to interview members of the Sumatran Orangutan Conservation Programme (SOCP) for an upcoming podcast series. An English tourist named Helen Feeney had found Indah on a pile of rocks in a small village. 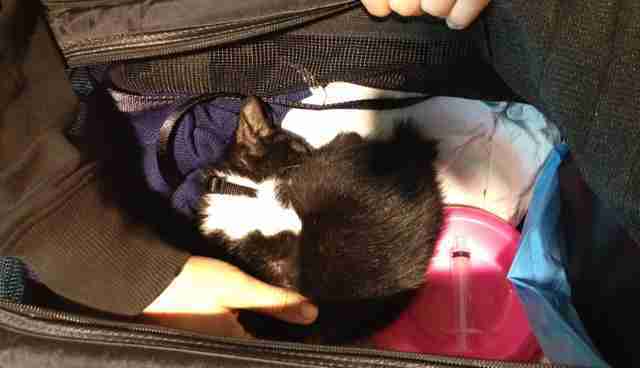 She was only about 7 weeks old, but she was malnourished, dehydrated and nearly dead. Feeney had saved Indah's life by carrying her around in a handbag. But Feeney was set to leave Indonesia in a few weeks, and she didn't know what would happen to Indah. When I met Feeney and Indah in Medan, I offered to adopt Indah and bring her to the U.S. When I made that offer, I had no idea just how difficult it would be to import Indah into the country. It's probably a good thing - if I had known, I might not have offered to adopt her at all. In the weeks that followed, my friends and I had to organize plane tickets, export permits and health certificates. We wrote countless emails and spent hours listening to hold music while waiting to speak to airlines. Indah's rescue was particularly difficult because there was so much red tape to get her out of Indonesia, but getting her into the U.S. was the easy part. There are actually no restrictions on bringing domestic cats into the U.S., and it's also pretty straightforward bringing a dog into the country. 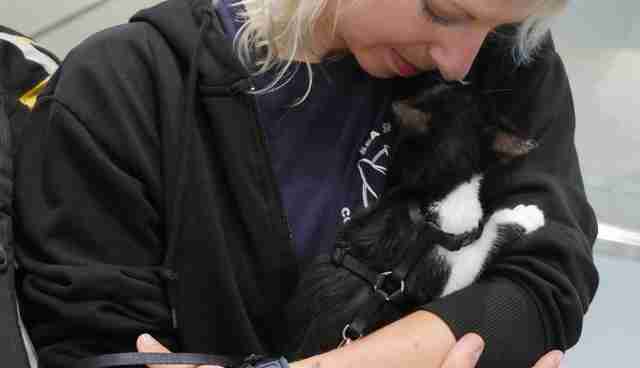 If you're thinking about taking a companion animal across international borders - either because you're moving countries yourself, or working to rescue animals from high-risk situations - here are a few tips. Gather as much information as you can before you start the process. A great place to start is ex-pat websites as they often provide basic information about moving internationally with pets. Make sure you also go to governing bodies' websites to find official information about import and export requirements for domestic animals. And always get the real scoop from local rescue groups in the country of origin - they'll often have useful information not listed on official government websites. 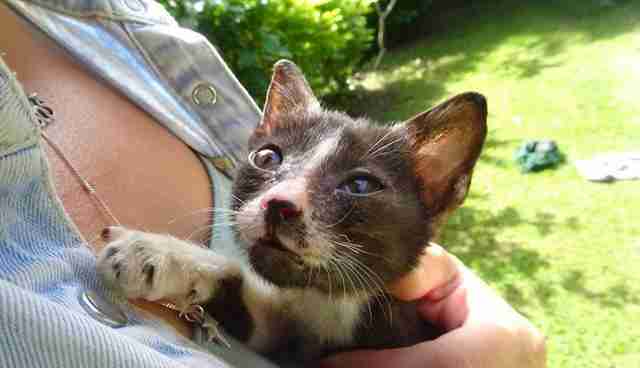 In Indah's case, she needed a letter of recommendation from the government authority in Medan, an Indonesian export permit, a rabies vaccination certificate, microchip and health certificate to leave Indonesia. Everything needed to be prepared at least 30 days in advance, so we needed to get on the case ASAP. My friend Tod Emko, co-founder of Darwin Animal Doctors, the only veterinary clinic in the Galapagos Islands, traveled to Indonesia to pick Indah up. 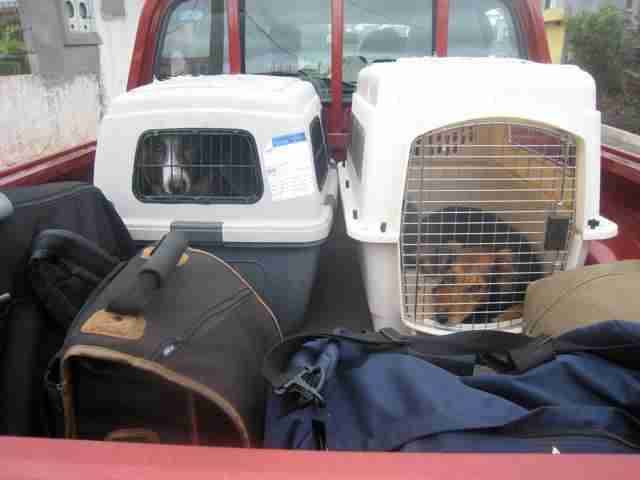 Emko has also transported dozens of animals in need from Ecuador and the Galapagos Islands. "In Ecuador, we went through a similar routine as we did in Indonesia," Emko tells The Dodo. "Then we found out at the airport that the government vet needed us to leave the airport and make a deposit for the exit permit at an outside bank - right before our flight. Only the cuteness of our puppy convinced the vet to help us get on the flight." 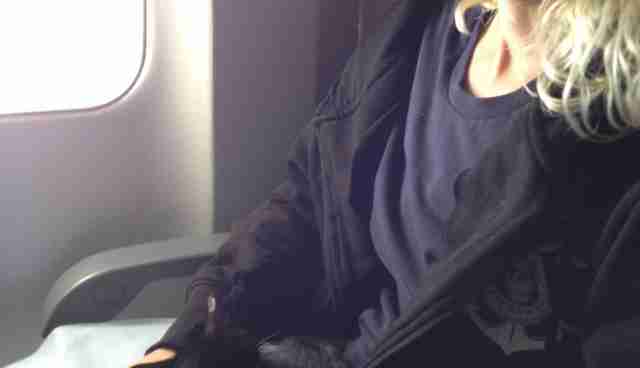 ... on Henry's lap when the flight attendants weren't watching. If your pet has to fly cargo (as Indah did between Medan and Singapore), make sure you choose a reputable airline with good pet safety ratings. It doesn't hurt to remind the flight staff to pressurize and temperature-control the cargo hold. Another great thing to do is to ask the flight staff if you can personally watch your pet board the plane - that means that the cargo staff will bring the carrier to you while you're on the jet bridge, and you can make sure your pet is OK. 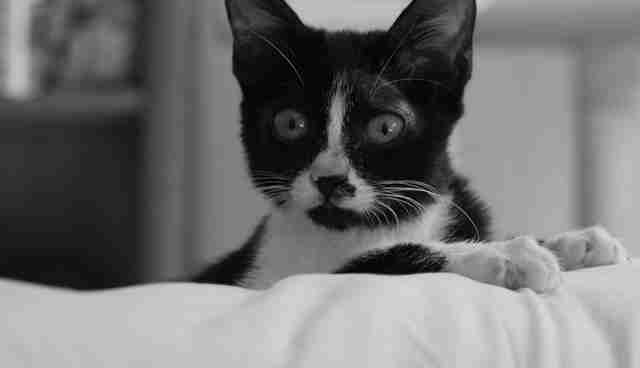 When Emko transported two kittens from the Galapagos Islands, he chose to fly with LATAM Airlines. "Not only was LATAM Airlines prepared to transport cats in the cabin," says Emko, "they also gave us separate boarding passes for the kittens!" Sometimes it's safer and easier to get help from professionals, especially when you're dealing with a language barrier. We hired a pet transport company in Indonesia to organize Indah's Indonesian export permit, and Jason's Pet Relocation to help us with Indah's Singapore stopover, which required Indah to get a transit permit and clearance from the Agri-Food & Veterinary Authority of Singapore (AVA). "When you are thousands of miles from home, and facing all kinds of last- minute surprises in isolated airports," says Emko, "you can't put a price on a local agency fighting for you at your side to get your companion through!" Make sure you shop around. Wine writer Christina Pickard moved her dog Mela from Perth, Australia, to the Hudson Valley in New York. "We did a lot of research and found that not all pet agencies are created equal," Pickard tells The Dodo. 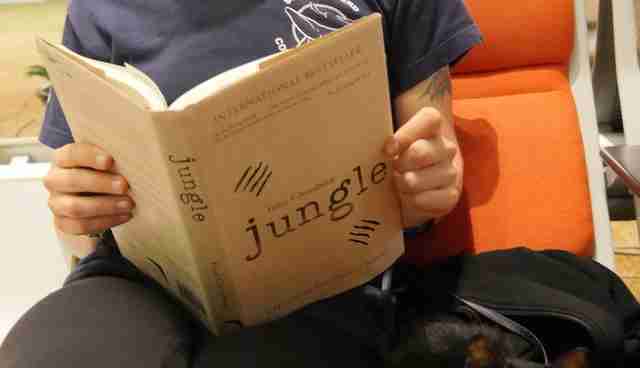 "Some of the bigger companies seemed like factories, transporting tons of animals all together in vans every day. We found a lovely little company called Petraveller and got a really personal experience. They were also cheaper than the big guys! We received videos and photos of Mela along the way until she boarded the plane, and they were very communicative when we landed in Los Angeles." Believe in Murphy's Law: Anything that can go wrong will go wrong. At least that's what happened to us. Flights needed be changed and re-booked. Documents we'd never heard of were demanded at the eleventh hour. Confusion transpired at the airport. Be prepared for this. "Probably the biggest hassle transporting animals through developing countries is facing flight staff, airport security staff, and customs officials who have often never dealt with an animal coming through their station," says Emko. 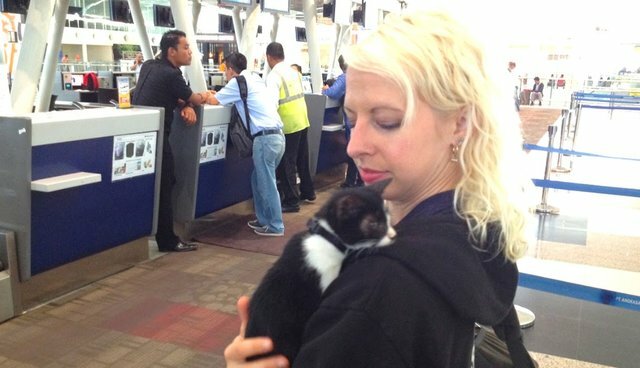 "When I brought my cat Simon through security at an airport in Colombia, they had no idea what to do about him. They wanted to put him through the baggage X-ray, and I had to explain to them why they shouldn't. Finally, we compromised, and I held my hands out to my sides, with Simon the kitten in one of my hands, and they wanded both of us simultaneously." Whatever you do, don't panic. We always found a solution for every issue we encountered, and got Indah through any obstacles. You will too. Or dog. Or rabbit. Or whatever companion animal you're transporting across international borders. Remember why you're doing this. Trust me - it will be worth it. Indah has now safely arrived in New York City, but her human posse is still trying to pay the bills she wracked up from all her international globetrotting and her medical treatments. If you'd like to help Indah start her new life in the U.S. debt-free, you can donate here. You can also follow Indah's adventures on her instagram page.